Aloha, readers of The Daily Magi and the Magi Football Blog. This your local boy, Gir Todafunk, back at ya once again with another Weekly Column for the Freshest of the Fresh. Well, there goes another game with me not being on the stats sheet. I think I am looking at sinking down the depth chart next year, this has been a quiet sesason for me. 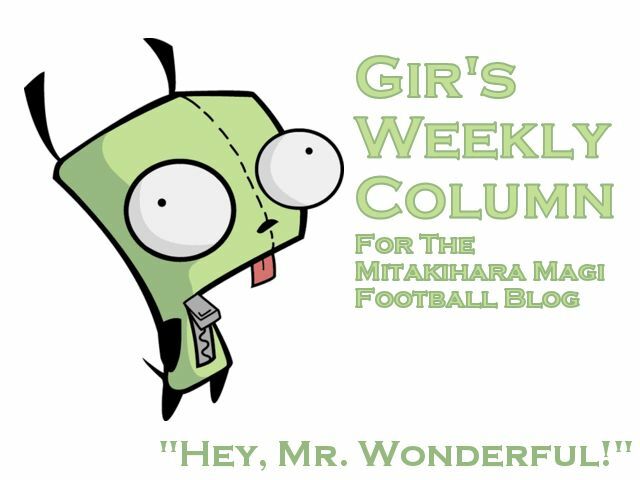 But, as long as we're winning and I enjoy blogging these columns, I can't complain. So, the scene now shifts from those tasty California carne asada burritos...to plate lunches! Basically, it's two scoops of rice, macaroni salad, some shredded cabbage, and your choice of entree. This is something that goes back to the plantation era of the 19th century. Something like that. It's the official dish of the state, and there are so many establishments that serve plate lunches. In terms of the rice, I go brown, as with all the players on the team. It's the rule. Now that brings up an important question: which places get the Gir of Approval? So many options, so little time. The key here is finding the best quality, the best value and the portion size fit for the appetite of men like myself and Nyaruko, who led the team in tackles last week. Gee, you sure burned those burritos wikiwiki, eh braddah? So, with that said, I now disclose my top five place to eat a plate lunch on the island of O'ahu. This is located in Kalihi. My recommended entree for this place is the Koi bento with steak, garlic chicken and ahi. Only issue is the restaurant's air conditioning, but then again, this is the islands, trade winds outside do make up for it. I don't mind; I spend the dog days of summer in hotter weather than this. What's that? You say it's November. Lemme tell ya, the heat is always the same in Hawai'i. It's just the rain and winds that make the difference, which isn't much. Mo'ili'ili in the house for this list on TDM and the MFB. Great, solid menu, although the price may turn some penny-pinchers off. Portions are man-sized, which justify the price to an extent. I've noticed that a lot of plate lunch frequenting locals out here judge an establishment by the ahi and lau lau served. I've tried both those options and they're pretty impressive. Poke, lomi salmon and shoyu chicken are also big hits at Yama's. A funny thing happened after our first practice on the island two days ago. When we were heading to the hotel, we saw this Onotogo food truck passing by. Onotogo is a contraction of the Hawaiian work "ono," meaning "delicious," and the words "to go." Clever. All of us quickly checked into our rooms, and then we formed a bee-line to get our fill. And that was our first-ever brush with the plate lunch phenomenon. Well, actually, there are plate lunch establishments in M-Town, but I only pass by them. Pulehu short ribs, teriyaki citrus furukake salmon, pulled pork and tuna are the calling cards of Onotogo. Better catch dat truck! This Kaimuki hangout is a favorite among the locals because many have eaten here since they were kids. They grew up on this. It's that big of a deal out here. Loco moco is a hamburger with a sunny-side up egg and gravy, and the best loco moco is at Rainbow Drive-In. Ironically, the Loco Moco was invented on the Big Island of Hawaii, my personal favorite of the islands. I'm a sucker for the color red, and truly believe that the University of Hawai'i-Hilo is the better of the two universities in the UH System. But I digress. Anyway, the shoyu chicken is top notch, the chili plate has a kick, and the corned beef hash with egg to boot gives this place the Gir of Approval. Behold, the mecca of plate lunch zeitgeist. The roast pork and masago wasabi poke at this place is designed to blow your mind and is their flagship entree. In addition, the service at this place is basically what you would see at any restaurant in Mitakihara Town. Friendly staff and cute faces. Gotta have those to drive serious business. The butter mochi and banana bread is to die for, as is the top sirloin. And of course, the poke is world class. Thus, Alicia's is No. 1 on this list and gets my personal Gir of Approval. And also, I declare Kalihi as the best Honolulu community to get a really good plate lunch. Hands down. Take a bow, you guys.